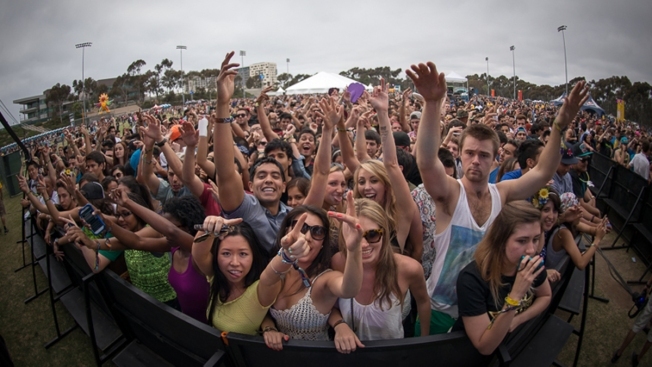 A snapshot of the crowd at UCSD's Sun God Festival in 2013. A University of California San Diego student found dead in his room just hours after the school’s annual Sun God Festival died of an accidental drug overdose, the San Diego County Medical Examiner’s office confirmed. Ambriz, who lived in the Village East Tower on campus, was found unresponsive in his room at approximately 1:30 a.m. on May 17 – an hour and a half after the university’s annual outdoor music festival, Sun God, ended at midnight. Ambriz attended Sun God and reportedly drank alcohol at the festival throughout the day and evening, according to details from the ME report. Eyewitness accounts said Ambriz had also admitted to taking a drug at some point during the day at the event, the report said. “After leaving the festival at midnight, his friend noticed him to ‘freeze’ at times during their walk back to their apartment. The friend also stated he was ‘starting to reach out into the air grabbing at stuff,’” the report said. The friend said Ambriz “had clenched teeth” and was having difficulty breathing. After leaving Sun God, the student returned to his dorm room with his girlfriend. While in his room, he took an unknown pill, according to the report. A short time later, Ambriz became unresponsive. He began talking “gibberish,” according to the report, and then collapsed. Friends called 911 and emergency medical crews arrived at Ambriz’s dorm and began efforts to save his life. He was transported to Scripps Memorial Hospital La Jolla, where he died around 2:30 a.m. The ME’s office said toxicological testing detected the 5-APB or “benzofury” drug and a low concentration of alcohol in the student’s system at the time of his death. The autopsy report said the effects of “benzofury” are described as “euphoria, empathy and color enhancement.” Side effects include nausea, vomiting, jaw-clenching and sleep. The report concludes that the reported symptoms the student was experiencing during the day at the festival and before his death are consistent with the effects of the drug. His death was attributed to an accidental overdose. Ambriz was an active student in the UC San Diego community. Right after his death, the UC San Diego News Center said Ambriz was a third-year Revelle College student majoring in computer science. He was also a member of the Phi Iota Alpha Fraternity and the MEChA organization. The university said Ambriz was involved with OASIS and graduated from UC San Diego’s Summer Bridge program. He also worked in the Climate, Atmospheric Science and Physical Oceanography business office at Scripps Institution of Oceanography. UC San Diego’s Sun God Festival happens every year at Rimac Field and is a highly-anticipated event among students. The event features several stages and live music by well-known artists. In years past, performers have included Drake, Thrice and Kendrick Lamar. The event is regarded as a time for UC San Diego students to let loose before their Spring Quarter final exams and before they break for summer.